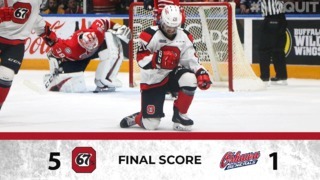 It was tighter and even more chippy than the last one, but the result of Sunday’s Eastern Conference Quarter-Final Game 2 was the same for the Ottawa 67’s…another big win. 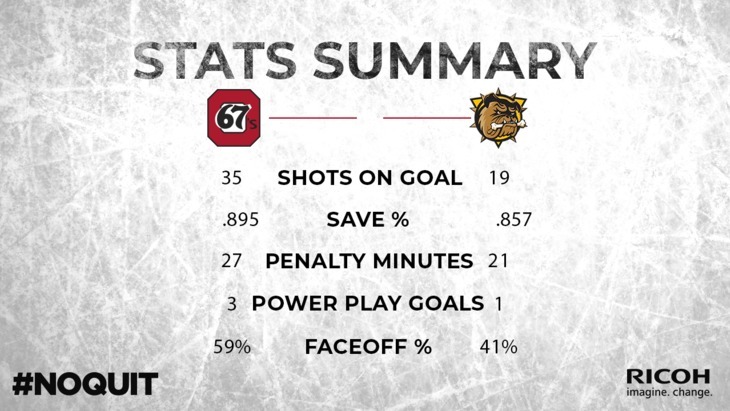 In downing the Hamilton Bulldogs 5-2 in this one in front of another loud crowd of nearly 5,000 at The Arena at TD Place, the 67’s have all the momentum (not to mention a 2-0 series lead) as the best-of-seven campaign now shifts to Hamilton for Games 3 and 4. 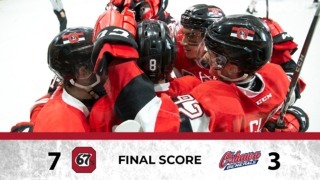 Graeme Clarke led the charge offensively for Ottawa in this one, as the 67’s sophomore scored his first OHL hat trick with a goal in each period of the game. Mitchell Hoelscher and Jack Quinn also scored for Ottawa while Mikey DiPietro turned away 17 shots to pick up the win in goal. While this one was tight through the first half, the 67’s opened up a 2-0 lead early with a shorthanded and powerplay goal. Ottawa maintained momentum for much of this one thanks to a steady stream of Hamilton penalties. While Ottawa was gifted seven powerplays in Game 1, they ended Sunday’s game with three powerplay goals on four opportunities. Ottawa gave up its share of penalties too, but Hamilton went only 1-for-8 with the advantage. 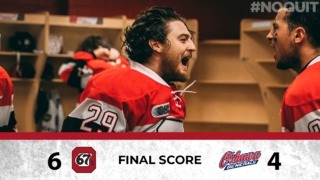 The 67’s are back in action on Tuesday and Wednesday nights in Hamilton as the Barber Poles look to take a stranglehold on the series. “The second game is always a tough one for the home team because sometimes they’re not ready for the push back. But our guys were ready, we knew they would be tough to beat and we played our game. We gave up 19 shots again on eight PKs, so it was a really good game for us. We have to take care of our business, we’re a good team because our focus is in the right place every day. With a hat trick in Game 2, Graeme Clarke now has five goals through the first two games of Round 1. He also had six shots on goal Sunday. Austen Keating had a pair of assists on Sunday, giving the forward five helpers through two games. Sasha Chmelevski had an assist to go along with his game-high seven shots in Game 2. After dominating the face-off circle in Game 1, Ottawa was strong once again with a 32-22 edge in draws. Hamilton’s Navrin Mutter received a match penalty for cross checking after taking a hit and then tracking down Lucas Peric and jumping him from behind in the first period with the game still scoreless. 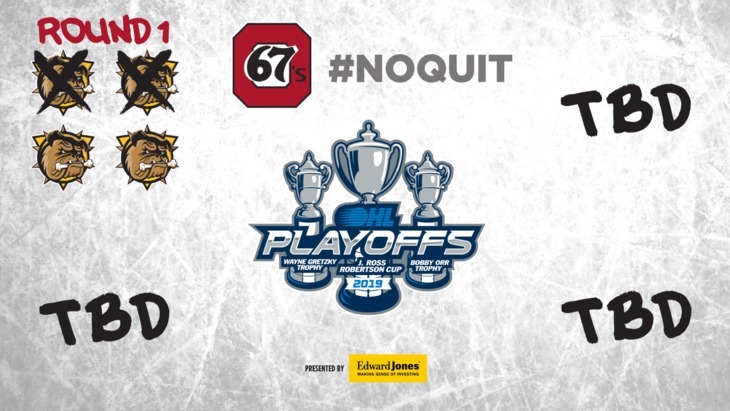 With the win, Ottawa has outscored Hamilton 14-5 through two games.